Junior astronomy student Robin Siskind counts Jupiter´s rings and tries to make out four of the planet´s moons during the university´s open house last week. 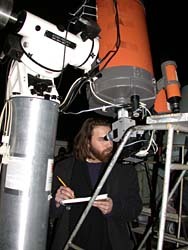 Astronomy undergraduate Brian Young observes Saturn through one of the university observatory´s telescopes. The lecture hall is full. All the seats are taken. Director of the University of Maryland Observatory Elizabeth Warner paces the room, waiting for tonight's lecturer. She repeats her instructions to the Astronomy 100 students present: sign the logbook with your ID ready to get credit for showing up. In the observatory next door, four telescopes are trained on the Orion Nebula, the Pleiades star cluster, Saturn and Jupiter. The University of Maryland Observatory open house is set to begin. The bimonthly open houses, held on the 5th and 20th of every month, draw crowds of retirees, families and amateur astronomers in addition to the Astronomy 100 students required to attend. The open houses begin with a lecture from a professional astronomer, usually focusing on his or her research. On this night, Stacy McGaugh of the astronomy department lectures on the theoretical dark matter, material thought to comprise most of the matter in the universe. Called 'dark' because it doesn't react with the matter we do--like light, atoms, molecules, etc.--it is by definition undetectable. McGaugh is conversational and breezy as he plants transparencies of background microwave radiation and the spin curves of spiral galaxies on the overheard projector. "We try to make sure the lecture topics remain accessible and interesting to the general public and amateur astronomers. Sometimes they go over everyone's head," says Warner. From the questions McGaugh fields after his lecture, the audience apparently found the material accessible. As McGaugh's applause fades, Warner then announces that the observatory is open. The crowd of almost one hundred shuffles to the low, white building next door. The observatory has an office section in the middle and two wings, or bays, housing telescopes. A pair of tracks elevated by a series of columns in line with the building extends out from the bay roofs. "When people come up they wonder why are there these extra columns with railroad tracks on top of them," Warner says. Their function may surprise them. Onto these tracks roll the roofs of the bays, exposing the telescopes to the night sky. Warner says roll-away roofs were adopted in observatory design to facilitate the equalizing of observatory and night air temperatures. Equalizing the temperatures is essential because the telescope's optical components are made of glass, which contracts as it cools, distorting the images it either reflects from a mirror or refracts through a lens. The bays are unheated, so the temperature is roughly equal to that of the night air. But there is still a difference, the bays are slightly warmer, that must be eradicated before observing can begin. "You don't want a warm lens contracting as you look through. That means it's changing shape and distorting what you're seeing," Warner says. With its small stature and proximity to the Comcast center, the Maryland observatory is not at all the picture of the traditional tall, domed building on a lonely mountaintop. Warner says that when the observatory was built it was "probably way out in the boonies, but the area grew up around it." The growth unleashed a flood of light from streetlights and signs into the sky to wash out the fainter objects. This light pollution rendered the observatory practically obsolete for "see to the edge of the universe" research. 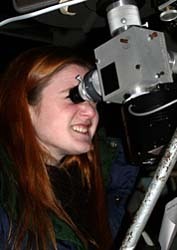 But Warner says that advances in technology, especially the advent of digital photography in recording telescope images, are making it possible to compensate for light pollution, enough so that she looks forward to getting the observatory back into serious research. For now, the observatory is primarily used for student research, the open houses and other community outreach programs. What the open house attendees will see on a given night depends primarily on the time of year and where the Earth and other planets are in their orbits. Of course the biggest factor is cloud cover. Tonight only a wispy flat stripe of cloud crosses in front of the heavens. Through one of the telescopes Saturn's rings, and several moons for those with sharp eyes, are visible. Jupiter, the Pleiades star cluster and the Orion Nebula are in the nearby telescopes. Assisting the attendees are astronomy graduate and undergraduate students who move and focus the telescopes. The public is only allowed to focus the eyepiece to accommodate those with glasses and varying eyesights. In addition to running the busy open houses, Warner runs observing programs for the public and amateur astronomers. Some of those programs are the New Telescope Owner Nights held in January "for all those people who got telescopes for Christmas and don't know how to use them." Last year the observatory started the Learn the Sky Friday program. She plans to start more programs for more advanced amateur astronomers to complement the work of professionals. "A lot of research in astronomy depends on the amateurs. For a long time, amateurs were the ones discovering most of the new comets and helping determine the orbits of asteroids." Warner says these activities, not exciting enough to garner grant money, lay the groundwork for the research of professionals. And she adds many amateurs have the equipment to do the work but don't always know that. It's unclear whether any new amateur astronomers were minted tonight, but the open house, as measured by the lines to the telescopes and the lively conversation, was a definite success. Warner has been running the open houses since last summer and worked with the former director, Gretchen Walker. She originally came from an observatory in South Carolina to Maryland to work on the Deep Impact project studying the composition of comets. She began assisting at the open houses, but her role changed abruptly when Walker left for a job in New York. "Talk about trial by fire. [I was told] 'OK, the program's yours. You get to run it.' And I was like, 'I was just going to teach in it,'" Warner says, laughing. For more information about open houses at the observatory, visit http://www.astro.umd.edu/openhouse.